Ramsey, NJ – September 22, 2016 – Building on its strong imaging heritage and extensive experience in document and content management, Konica Minolta Business Solutions U.S.A., Inc. (Konica Minolta), today announced the acquisition of Maryland-based Quality Associates, Inc. (QAI) and DocPoint Solutions, LLC (DPS). The acquisition will add value and further enhance Konica Minolta’s ECM capabilities through QAI’s core competencies, namely SharePoint and Kofax and BPO scanning services in the East. QAI is an established provider of enterprise-class services and customized solutions for content management, document imaging solutions and BPO scanning. The company also provides clients with cutting-edge solutions that address the many issues that document management brings to an ever-changing marketplace. DPS is a Microsoft Silver Certified Partner, with a specialization in the discovery, implementation, training and support of Microsoft SharePoint solutions. Founded in 1986 and located in close proximity to both Baltimore and Washington, D.C., QAI marks three decades of delivering services to federal, state and local government agencies as well as commercial and private organizations across a wide range of industries. DPS, an affiliate of QAI, was established in 2008 and provides expertise in ECM and SharePoint solutions. QAI and DPS will operate as subsidiary companies that will be led by Les Walker, president, Business Intelligence Services, ECM, Konica Minolta. The synergy between the organizations will provide new opportunities for both entities. Konica Minolta will benefit from QAI’s and DPS’s wide range of commercial industries and federal agencies, and grow its SharePoint and BPO practices in the East. QAI and DPS will join a workforce of over 8,000 employees in North America adding resources and scale to their existing operations. 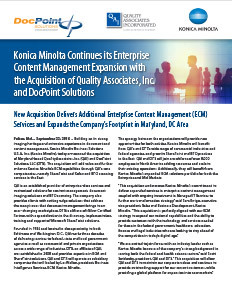 Additionally, they will benefit from Konica Minolta’s expanded ECM solutions portfolio for both the Enterprise and Mid Markets.